Spits Game: The NBA's Crucial Year Three part 3: "A Rose on the Hardwood"
The NBA's Crucial Year Three part 3: "A Rose on the Hardwood"
Derrick Rose has set the bar high for all first round draft picks because of the accolades he achieved during his third NBA season. In the 2010/11 season, Rose's third year, he was a starter on the East All-Star team, named to the All-NBA first team, and selected as the league's Most Valuable Player. His brand of basketball was so exceptional that season that when the most recent collective bargaining agreement was finalized, there was a provision written in to reward players that out-play their rookie contract. Part 1 of this series looked at players from the 2011/12 rookie class who have shown star potential but need to raise their level of play to be considered for the 25% max. Part 2 featured the young stars of this class who are likely to receive the max. In this final installment of "Year Number Three" series, we'll look at this draft's cream of the crop and his chances of earning "The Derrick Rose Provision"
In Irving's rookie season, he made game winning shots versus playoff teams and was named MVP of the Rising Stars challenge during All-Star Weekend en route to garnering Rookie Of the Year honors. In his second season, he continued to nail game winning shots and was dubbed prince of the All-Star Weekend after breaking Brandon Knight's ankles multiple times during the Rising Stars challenge and winning the 3-point shootout. He held his own while playing with the big boys in the ASG, so much that buzz began to grow and the debate on social media exploded in regards to Kyrie's place among the NBA's elite point guards. The CBA states that a player has to achieve certain standards in order to receive the 30% max otherwise known as the "The Derrick Rose Provision". 1) Win NBA MVP either this season or the next. 2) Named All-Star starter twice. 3) Named to any of the three All-NBA teams. What are Kyrie’s chances of winning the NBA Most Valuable Player Award? Irving’s chances are slim. This award is decided by the NBA media and isn't just given out to anybody. 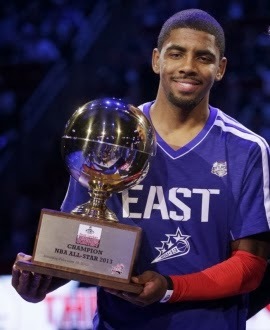 Kyrie was indeed voted MVP of the Rising Stars challenge as a rookie. However, in order to win the regular season MVP, a player has to win a substantial amount of games. Herein lies the problem. Can Kyrie make the players he's supposed to lead better? In the off season Cleveland’s front office met Kyrie half-way by upgrading their roster. The Cavaliers acquired Jarrett Jack, Earl Clark, and Andrew Bynum in free agency in addition to first round draft picks Anthony Bennett and Sergey Karasev. The return players - Tristan Thompson, Anderson Varejao, Tyler Zeller, and Dion Waiters – are no slouches. Mike Brown is an excellent defensive coach, the team taking on this hardnosed identity should account for some extra wins. Legitimate MVP candidates come from 50 win teams. Cleveland won’t make it to 50 but anything is possible, if they make a large leap, it’s because Kyrie elevated his game and earned an MVP. Will Kyrie be chosen to any of the three All-NBA teams? The odds of this happening are much better than him walking away with the Maurice Podoloff Trophy. Kyrie has to become a better floor general in order for the NBA coaches to select him to be among the best six guards in the league; Chris Paul, Kobe Bryant, Russell Westbrook, Tony Parker, James Harden, and Dwyane Wade were selected last season. He’d have to supplant at least one of them and out-play the likes of Stephen Curry, Deron Williams, and Derrick Rose. The addition of Jarrett Jack on his team will ease some of the distribution responsibilities as well as provide an on-court mentor to show him how to truly play the position in this league. What are the odds of Kyrie being voted to the All Star game as a starter? Due to his increased visibility from the advertising campaigns, his highlight-making handles, and the love affair that social media has with him, this is the likeliest achievement for him to reach. Being named a starter for the All-Star game is in the fans hands. Last season Kyrie finished fourth behind Wade, Rajon Rondo, and Williams among guards in Eastern Conference voting. Derrick Rose's popularity is such that he is a virtual lock to start if he doesn't suffer any setbacks in his return from knee injury and remain healthy. Wade was the leading vote getter at the position last year but there has been much discussion about his skills declining with age. Williams is the face of a Brooklyn team that is expected to contend for a title, couple that with playing in the league's premier market, he will get his fair share of votes. Rondo is injured and isn't set to return until December, therefore receiving more votes than him shouldn't be difficult. The best chance for Kyrie to be named starter is for a buzz to be generated powered by his team starting the season on fire and hovering close to the top of the Eastern Conference standings. For that to happen, Australian-born sensation will have to elevate his game to the next level. 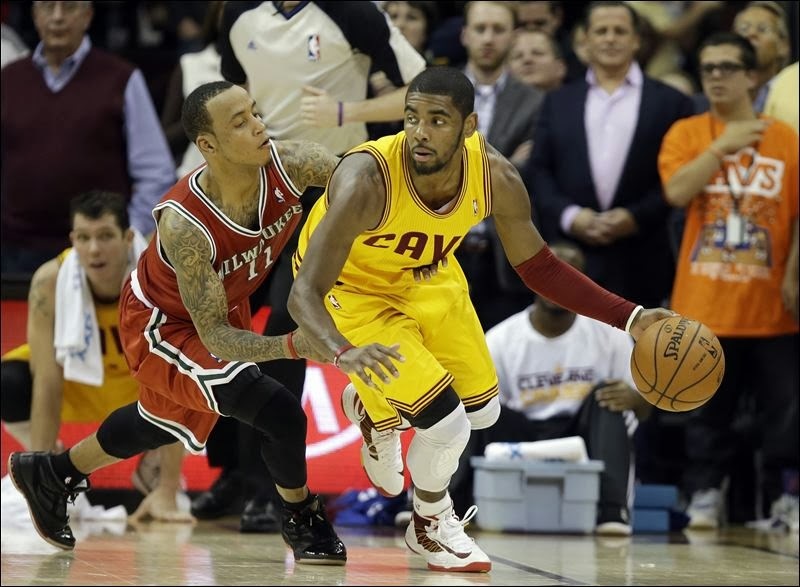 The task Kyrie needs to focus on this season is making the game easier for his teammates, which is what leaders do. As mentioned before, Irving has a better supporting cast around him this season; defenses will not be able to focus solely on him, and scoring will be easier than it has been. If he wants to be the best player in the league while playing point guard, his goal should be trying to increase his assists tally by at least 2 more than his 5.9 average of yesteryear. With Mike Brown’s coaching, his defense should improve. Truly, who does not love a winner? If he accomplishes these things, Cleveland should have a winner in its city. Kyrie –because of this year three– will be like Derrick Rose on the hardwood, but more importantly, like him in the bank.